Travis County is a long-time investor in Capital IDEA. Funds from Travis County are given to allow Capital IDEA to deliver services that help individuals improve workplace skills, obtain employment, succeed in the workplace, and help employers secure a skilled workforce. In 2016, Travis County increased their engagement with a decision to host interns in their IT Department. 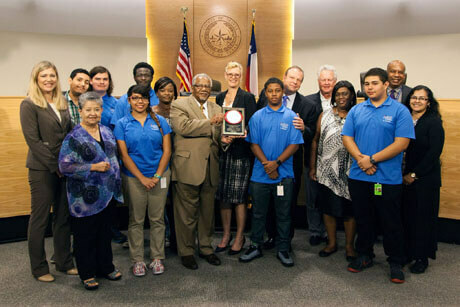 This commitment made Travis County one of Capital IDEA’s first employer partners to host a Career Expressway Tech student, a pilot program launched in 2015. Capital IDEA’s Career Expressway students are heading for a great career in IT, and along the way we work to provide them with internships that introduce them to an IT workplace. Travis County’s decision to host interns means they share our vision, value local talent, and understand what’s heroic about getting the education required for a great job. You can read more in the Austin American-Statesman article posted June 25th by Dan Zehr, found here.